The situation is much improved on last year and since the March report it has cooled down and we have had some more rain so the lower stretches of our rivers are coming into their own including the lower beats of the Smalblaar. The Holsloot is also producing some nice fish but the Witte is still suffering from the previous drought. There are a few browns left in the river and these hardy survivors of the drought need to form the breeding stock to re-populate the river. What is of concern is the litter left by picnickers on the Smalblaar and Holsloot and although the CPS workparties and fishers remove this regularly CapeNature need to send in their inspectors to police the area. 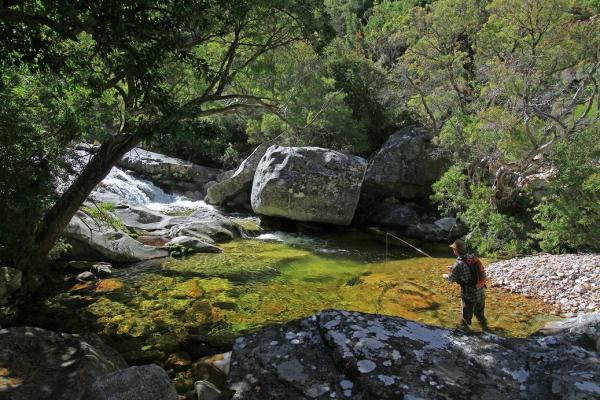 The Jan du Toits in the Waaihoek area which is now available only on a lottery system has apparently fished very well in the last year. No news has been received on the Witels in the Ceres district, but the higher reaches hold a substantial population of browns. News from the Lakenvlei near Ceres is that it is starting to cool down and fishing should improve within the next month, but bass remain a problem in this stillwater. The Jan du Toits – photo by Leonard Flemming.